The perfect stamp for administrative duties, marking documents with both popular phrases and dates. The stylish self inking dater features a new high quality brushed stainless steel finish accentuating a professional look with added durability. Complementing the robust stamp, an ergonomic handle and cushioning elements reduce vibrations guaranteeing a better imprint. 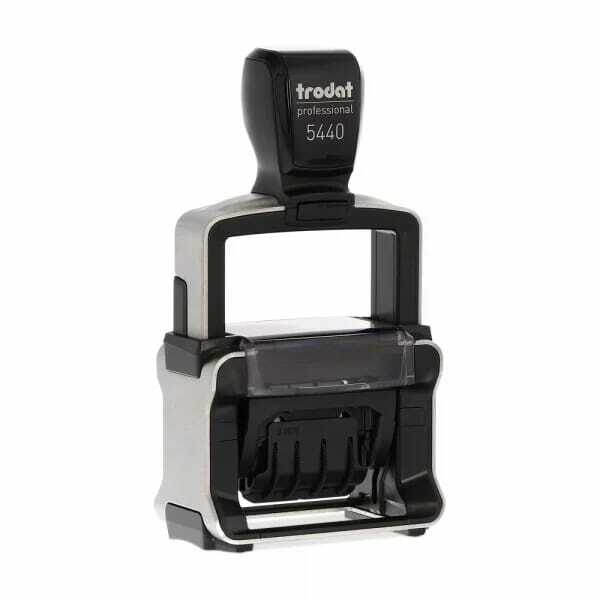 The Trodat Professional 5440L is a self-inking date rubber stamp with an integral replaceable ink pad that is made with 4 popular words and phrases. The 5440L is provided with exchangable texts, which includes: "Received", "Paid", "Faxed" and "Posted". In addition to this there is also a centred date band, which includes date, month and 12 consecutive years. The date has the height of 4 mm and the format: day, month (in letters) and year. The 5440L creates an imprint of 49 x 28 mm. Customer evaluation for "Trodat Professional Line 5440L - Received/paid/faxed/ posted + 4 mm date"